Fashion Week presents itself as the perfect outlet for designers from all corners of the world to showcase their collections. 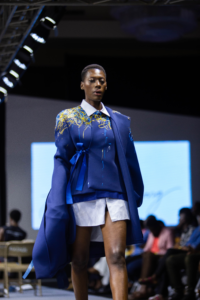 The theme for this year’s Glitz Africa Fashion Week, ‘Projecting Africa culture through designs’ sold itself out to the modern contemporary African designers with the idle mentality of making Africa a better home for Africans, whiles exporting the what Africa truly stands for to the world through designs. 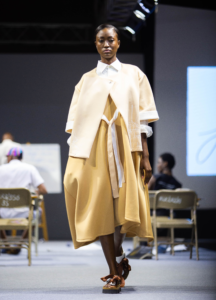 Representing the newest crop of designers in Africa, Papa Oppong’s ‘The Boy Likes Ribbons’ from his Spring/Summer 2019 collection was a paragon of the new era of African designs. The goal was to leave fashion enthusiasts with the thought and wonder of ‘Who is this designer?’ and it was certainly accomplished as his designs and stage setting of a classroom got everyone excited and rooting for his next collection. Speaking to the young designer with the mentality of a ‘living legend’ backstage, he particularly exhumed his inspiration behind ‘The Boy Likes Ribbons’ collection. The collection according to Papa is all about him going back to childhood and the things that he loved growing up. 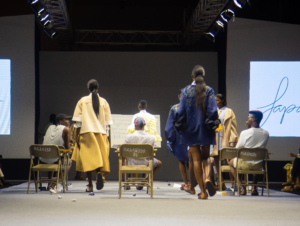 Papa’s inspiration influenced his classroom runway concept as he intended to take the whole world back to basics, the root of his SS19 collection. Being one of the front runners in fashion illustration and women’s wear design in Ghana, Papa Oppong sees himself as very lucky to be doing both at the same time and to him it hasn’t been difficult balancing the two talents but a very interesting journey filled with many memorable experiences so far. “It’s been an interesting journey so far…I’m learning a lot. This all started with me simply drawing fashion figures and dreaming of what the woman I style would look like. Finding out who the Papa Oppong woman is has been a long journey filled with many fashion fails and hurdles but I can definitely say I’m more confident now as a designer than I was two years ago and I now know exactly who the Papa Oppong woman is, what she likes to wear, where she hangs out and what her interests are. Mentally profiling the woman who would wear my clothes has really helped me focus and discover my true aesthetic as a fashion designer. I have always said that I don’t design for every woman but every woman can wear my designs. This simply means that my label constantly creates room to accommodate different women; diversity. The Papa Oppong woman is every woman. 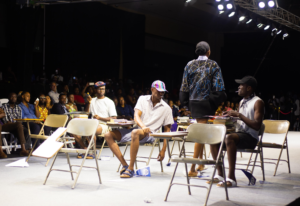 Our fashion week this year was themed ‘Projecting African culture through design” so designers were mandated to fan out their concept of fashion, yet projecting the African culture. 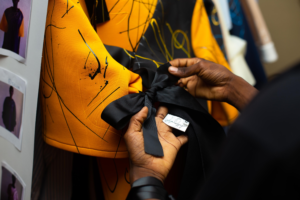 With ‘The Boy Likes Ribbons’ flooding the runway and taking one of the spots as the highlights of the show, Papa Oppong speaks about his clothes and in concert with the theme as something new which does not depict the cliché look of what African fashion is. 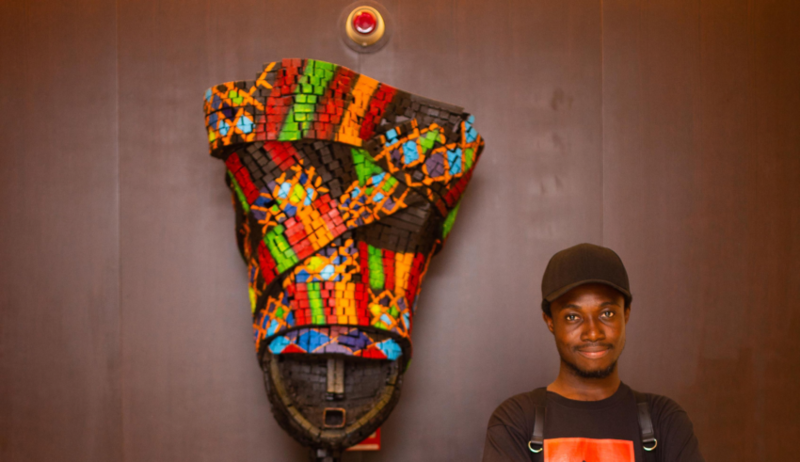 He aims to be among the new set of designers redefining African fashion. His brand is well known for not following trends, but standing out in the midst of trends. 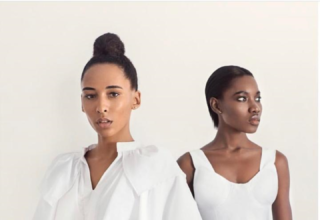 Although proudly African, with the global state of fashion right now, Papa doesn’t just pick inspiration from his immediate surroundings, but always looks beyond what the ordinary African designer sees and envisions. He intends to be labelled as unpredictable when it comes to his designs and style. With Instagram and Pinterest at his disposal, the ‘The Boy Likes Ribbons’ inventor never runs out of new ideas and inspirations. Speaking about his international icons of all time, namely; Alessandro Michele of Gucci, Miuccia Prada and Rihanna, Papa Oppong shared his fun facts about them and how he is building himself up to fall on the same level as these iconic creators and innovators. Papa Oppong has presented collections in both Ghana and the US and has worked in the Ghanaian fashion industry for over 5 years. Papa has been featured on CNN and was recently named ‘Creative of the Year 2018 at Fashions Finest Awards in Nigeria’. At the just ended Glitz Style Awards, Papa Oppong was also nominated for the ‘Rising Style Influencer of the year’ category. 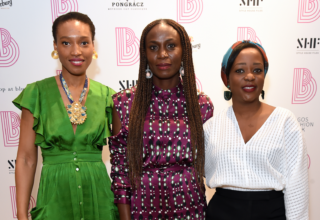 Pieces from his latest SS19 collection: ‘The Boy Likes Ribbons’ was spotted at the just ended GLITZ fashion on personalities like Editor-in-Chief of Glitz Africa magazine Claudia Lumor, Managing Director of Elle Magazine South Africa Danielle Bowler and songstress Deborah Vanessa.